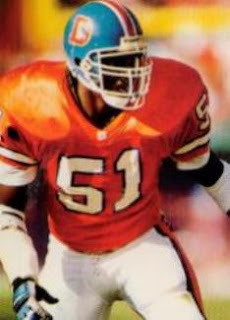 Considered the top outside linebacker available in the 1991 NFL draft, Croel was taken in the first round (fourth overall) by the Broncos. With great speed and agility, he was still a raw talent and moved into the starting lineup early in the season, although injuries cost him three games. Broncos went 12-4 to finish first in the AFC West and take the second playoff seed in the conference while leading the AFC in sacks (52), fewest passing yards allowed (2755), and fewest points allowed (235). Won AFC Divisional playoff over Houston Oilers (26-24). Lost AFC Championship to Buffalo Bills (10-7). Croel was moved to weakside outside linebacker in 1992, across from Simon Fletcher, and was effective but had half as many sacks as during his rookie season. He remained a fixture in Denver’s fine corps of linebackers until 1994, after which he left as a free agent to rejoin former Broncos Head Coach Dan Reeves with the New York Giants. Following a mediocre year in 1995, Croel moved on to the Baltimore Ravens for ’96 and, afflicted by injuries, bounced around thereafter, playing with the Rhein Fire of NFL Europe and Seattle Seahawks in 1998. Croel had one last shot with the Los Angeles Xtreme of the XFL in 2001 but retired before the season started. Overall, for his NFL career, he appeared in 102 games spread over six seasons and recorded 24 sacks but did not sustain the success of his outstanding rookie year.